Island foxes on San Miguel, Santa Rosa and Santa Cruz islands have been taken into captive breeding facilities to ensure their survival and to increase their numbers to a level that facilitates their safe release back into the wild. On San Miguel and Santa Rosa, increased population numbers and the absence of golden eagles has allowed initial releases of foxes back into the wild. 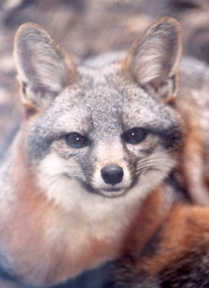 All released island foxes on the northern islands have been radio collared. The radio collars enable biologists to monitor the foxes’ activity and determine their survival. A program of humanely capturing golden eagles is ongoing. Approximately 40 golden eagles have been successfully captured and released in northeastern California. To date, none of the relocated eagles has returned. Currently, San Miguel and Santa Rosa islands appear to be clear of golden eagles, however some golden eagles remain on Santa Cruz island. Bald eagles are being reintroduced to the northern Channel Islands. Up to 12 juveniles will be released annually on Santa Cruz from 2002 to 2006. It is hoped these bald eagles will establish territories when they reach maturity and deter golden eagles from colonizing the Channel Islands. Feral pigs are being removed from Santa Cruz Island as part of a joint project conducted by the National Park Service and the Nature Conservancy. Non-native plants and animals are being removed from the northern islands in an attempt to return the island habitat to its original natural ecosystem condition.